Background: Adolescence is a period during which psychological foundations are laid down as well as consolidated. Not much information is available on rural Indian adolescent girls and their psychological health. Methods: We did a pilot survey of psychological health of 80 adolescent girls residing at KOKAN region of western India. Psychological health was evaluated using Youth Paediatric Symptom Checklist (Y-PSC) consisting of 35 items with maximum score of 70. Girls with a score >30 were classified as psychologically impaired. In addition we also collected random blood sample and measured the micronutrients. Macronutrient intake was estimated by 24 h recall. Results: The mean age of the girls was 14 years with a standard deviation of 1.5. In all 35/76 (46.1%) could be classified as psychologically impaired. 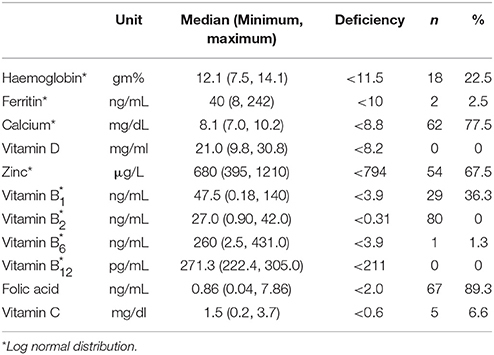 There was a high prevalence of micronutrient deficiencies with varying degrees. More than 65% were deficient in calcium, zinc and folic acid. About 22% were anemic and 36% were vitamin B1 deficient. More than 75% had a low recommended dietary allowance (RDA) of macronutrients. Those with poor serum calcium concentration had higher psychological score (p < 0.05). Fat and calcium intakes were inversely associated with psychological score (p < 0.05 and p < 0.001 respectively). Odds ratios for psychological impairment were significant for those with low calcium levels [1.47 (95% CI 1.21, 4.31)], and for those with low calcium intake 1.43 (1.08, 3.19) and low iron intake 3.04 (1.02, 9.26). Conclusion: Our pilot data has shown the urgent need to improve the nutrition of adolescent girls, which could improve their psychological health. Adolescence is the stage of life in which a child transitions into an adult. It is characterized by accelerated growth, sexual maturation, and an increase in the complexity of psycho-social interactions. During adolescence physical, psychological and social foundations are laid and consolidated. More than half of the world's adolescent population live in Asia. India has the largest population of adolescents1. In many developing countries more than 50% of the adolescents fail to achieve their growth potential due to inadequate nutrition and faulty dietary habits (1, 2). Seeds of many psychological disturbances in adulthood are sown in adolescence. Adolescent children face many obstacles for healthy living. Most of the healthcare services in India are designed either for adults or children. Adolescent girls form a crucial segment of the population and as prospective mothers they form a vital bridge between the present and next generation. In India the prevalence of malnutrition among the girls remains very high (3). Adolescent girls are particularly vulnerable to poor nutrition and anemia (4–8). They face multiple barriers of gender discrimination, superstitions and social norms. This in turn affects their learning, cognitive function, and scholastic performance (9). 3. Physical and nutritional assessment. In a sample of adolescent girls we measured the nutrients in their blood and evaluated their psychological health to test the hypothesis that poor nutritional status will be associated with poor psychological health. Our hospital covered 30 schools as a part of empowerment of young women program in 2016. We randomly selected a school and listed out all the 297 adolescent girls. Then we randomly selected 80 adolescent girls and enrolled them in our study. They were brought to the hospital as part of empowerment program. During their stay at the hospital, a random blood sample was collected and they underwent various investigations and assessments. The height and weight of the adolescent girls was recorded and Body Mass Index (BMI) was calculated. International Obesity Task Force (IOTF) standards (10) were used to classify them into various categories of thinness and obesity. Stunting and severe stunting was defined using WHO reference curve for height2. All the subjects in our study filled Youth Paediatric Symptom Checklist (Y-PSC) (11, 12). This test is a tool used t to recognize cognitive, emotional, and behavioral problems in adolescents. It consists of 35 items each of which is rated “Never,” “Sometimes,” or “Often” t and scored 0, 1, and 2 respectively. The test gives a composite score. The cut-off score of 30 or higher indicates psychological impairment. The Y-PSC was translated in to the native language “Marathi.” Pretesting of translated scale was done on a sample of 10. Chronbach's alpha was 0.71. The venous blood (random sample) was drawn from the subjects. Sample in the EDTA bulb was used for estimation of hemoglobin using Cismax XP 100 cell counter. Serum was separated from the sample in the plain bulb and used for estimation of Calcium, vitamin D, Vitamin B1, B2, B6, B12, Folic acid, Vitamin C, and zinc, levels. The serum Calcium level was estimated by modified arsenazo III method using semi auto analyser. Zinc was estimated using semi auto analyser. Vitamin D, Vitamin B12, and Folic acid levels were estimated using Cobas e-411 chemiluminescence. Vitamin B1, B2, and B6 were estimated by ELISA method. Vitamin C was estimated using Colorimetric method by Aye Kyaw (13). We used 24 h recall for the dietary assessment. Nutritionist recorded each food item consumed by the subject. We used standardized cups to estimate the amount of the portion size consumed. Nutritive value of the food item consumed were estimated using the reference database (14). All the investigations and assessments took place in the hospital on the same day. Data has been presented as median (minimum – maximum) and as percentages. Miconutrient concentrations and estimated macronutrients, anthropomrtric measurements were tested for normality using Shapiro-Wilk test. Vitamin D, Vitamin C, height, and weight were the only normally distributed variables. All the non-normal variables were log transformed. Association between micronutrients, macronutrients, and psychosocial score was analyzed by multiple linear regression. Regression coefficient β and p-values were derived by linear regression using micronutrient concentration, estimated macronutrient intake as exposures and psychosocial score as a outcome. Regression coefficient β represents change in psychosocial score (outcome) per unit change in exposure variable (micronutrient or macronutrients). p-values were adjusted for age. We divided the micronutrient concentrations and estimated macronutrient intake of calories, protein, fat, calcium, and iron in to age specific quartiles. Those lying in the lowest quartile were tagged as having low levels of that micro or macronutrient, and the rest were tagged as having high levels. Odds ratios for psychological impairment for those with low levels were calculated together with 95% confidence intervals. Those lying completely beyond 1.0 or below 1.0 were considered as significant. An awareness session for parents and school teachers was conducted before the start of the study and their signatures were obtained and at the time of blood collection individual parents were informed verbally. Assent of adolescent girl was also obtained. Consent procedure and study was approved by the Ethical Committee of BKL Walawalkar Rural Medical College. Study took place in December 2016. About 46% of girls could be classified as psychologically impaired. Median age of the girl was 14 years with a range (minimum-maximum) of 11–16 years. Based on WHO criteria 23.8% were stunted. Using IOTF classification 61% were underweight, 35% normal weight, and only 4% were obese. Table 1A. Anthropometry of adolescent girls (n = 80). About 23% girls were anemic. More than 2/3rd were calcium, zinc and folic acid deficient. About 36% were vitamin B1 deficient. Vitamin C deficiency was extremely low (6.6%). None of the subjects were deficient in Vitamin B12, Vitamin B2, vitamin B6, and Vitamin D (data not shown). Table 1B. Micronutrient levels in adolescent girls (n = 80). Table 1C. 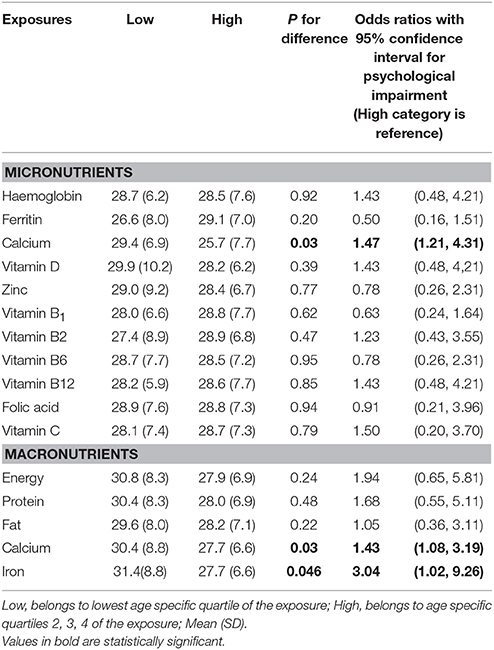 Macronutrient intake in adolescent girls (n = 80). On multiple regression analysis calcium concentrations as well as fat and calcium intake were inversely associated with psychosocial score. Table 2. 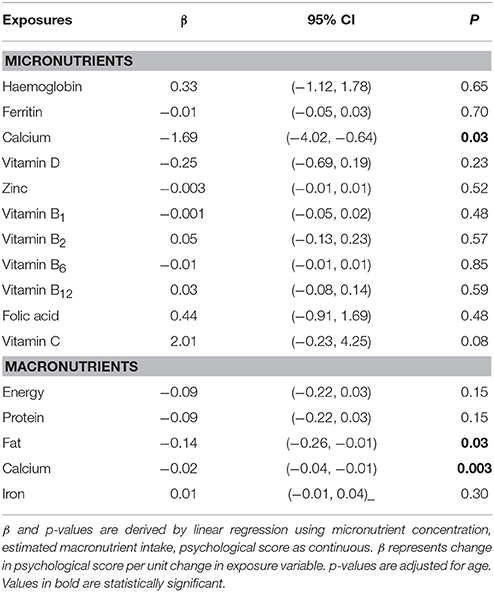 Association between micronutrients, macronutrients and psychological score. Subjects with low calcium concentrations had significantly higher psychological score when compared to those with high concentrations (29.4 vs. 25.7, p < 0.05). They also had significant odds ratio of psychological impairment [2.47, 95% CI (1.21, 4.31)]. Odds ratios for psychological impairment were also significant for those with low calcium and iron intake. Table 3. Psychological score and odds ratios for psychological impairment for those with low and high levels of micronutrient or macronutrients. This is the first report from the KOKAN region of western India reporting the association between nutrition and psychological health of rural adolescent girls. A very high proportion of deficiency was observed for 3 micronutrients (zinc, calcium, and folic acid) followed by moderate deficiency of vitamin B1 and substantially low deficiency of vitamin C.
There have been many reports linking micronutrient deficiencies with psychological health of adolescents. Two studies in Iran (15, 16) found inverse association of serum zinc levels with mood disorders including depression and anxiety among adolescent females. A study in Turkey (17) found lower levels of vitamin B12 and vitamin D in patients with obsessive compulsive disorder compared to control group though there was no significant difference between groups in terms of folate levels suggesting the role of one carbon metabolism. A study in US (18) among Latino pregnant adolescent girls has reported the associations between micronutrients and depression. There have been some reports from India on psychological parameters among the adolescents and their link to nutritional exposures. A study in adolescents from the city of Hyderabad (19) found an association between iron nutrition, physiological deregulation, and stress. Another study (20) amongst secondary school adolescent girls in Pune city found poor cognitive performance amongst girls with zinc deficiency. In our study there was no association of zinc concentrations with psychological impairment. Similar observations have been made with respect to folic acid in a study from Delhi (21). Both of these reports come from urban settings. We have measured total calcium concentration which is in lower range in more than 70% of the girls. Critical initial laboratory testing is needed to rule out ionic hypocalcaemia. Irritability and weakness can be correlated to mild hypocalcaemia in our subjects which we have not recorded. Also vitamin D deficiency was not observed in our study. Thus in our study with normal levels of vitamin D, the etiology of hypocalcaemia can be correlated only to nutritional deficiency. Another reason could be, due to increase growth velocity during adolescent period, the increased demand of dietary calcium is not met. Other than calcium we have measured other micronutrients which did not show association with psychological impairment despite low levels in most of them. One surprising finding in our study was lack of low vitamin B12 concentrations which have been reported to be very low in other regions of India (22–24). Though we have not measured folate, the folic acid (essentially a synthetic form of folate) deficiency was very high (89%). Neither vitamin B12 nor folic acid were associated with psychological impairment. Homocysteine plays an important role in B12–folate metabolism, but we have not measured homocysteine in our study. Deficiency of other B vitamins, B2 and B6 was absent in our study. Proportion of subjects with vitamin B1 deficiency was very high. But this needs further exploration on a larger scale. Unlike calcium there was a lack of association of other micronutrients (zinc, vitamins B1, and folic acid) with psychological impairment where our subjects were substantially deficient. This may suggest a role of specific micronutrient in psychological impairment. There were many positive aspects of our study. This was the first report from the KOKAN region on the link between nutrition and psychological health of the rural adolescent girls where malnutrition is still prevalent. Yet the deficiency of 2 major micronutrients vitamins B12 and D was virtually absent. The negative aspects are the small sample size and lack of homocysteine measurements to explore B12 folate pathway. We used Y-PSC because of its simple administration. Y-PSC has been used in Nepal (25) which has similar socio cultural setting like India. We could not analyse further according to Y-PSC clusters because of small sample size. Also we were unable to explore the independent effects of each of the nutrients measured again because of small sample size. We are planning to do a study on larger scale to replicate our findings and plan to examine the effect of a particular nutrient or food on not only psychological health but also on cognitive function. India is witnessing a rapid rise in prevalence of non-communicable diseases (NCD) like diabetes, coronary heart disease, and hypertension over last decade (26–30). In a developing country like India, where there is a lack of basic needs of life with lowest per capita income, spending money on health is beyond reach for most people. The best way to fight the epidemic of NCD's is to prevent them developing. British epidemiologist David Barker laid down the hypothesis in the 90's which says that intrauterine growth retardation, low birth weight, and premature birth have a causal relationship to the origins of hypertension, coronary heart disease, and non-insulin-dependent diabetes in the middle age (31, 32). If the risk of many NCD's in adulthood in our communities is largely determined before birth, then a critical question to be addressed is the extent to which these risks may be minimized. Poor fetal growth is most commonly diagnosed in late gestation or even after birth, and there are not yet any effective intrauterine interventions for the baby who is growing poorly. We consider that the best approach to the epidemic of NCD's in adulthood is to focus on the health of adolescent girls, as the prospective mothers of the next generation. We have demonstrated how the poor nutritional status of adolescent girls affects their psychological health. It is possible that improvement in their nutritional status using dietary, and food based interventions will lead to improvement in their own psychological health and also benefit the subsequent generations with reduced risk of NCD's in the adulthood. We are grateful to the community, in particular the adolescent girls for taking part in this study. We would also like to thank their parents for giving the consent to study the adolescent. 14. Nutritive Value of Indian Foods. NIN, ICMR (2010). 24. Bhatia P, Kulkarni JD, Pai SA. Vitamin B12 deficiency in India: mean corpuscular volume is an unreliable screening parameter. Natl Med J India (2012) 25:336–8. 31. Barker DJP. Mothers, Babies, and Health in Later Life. Edinburgh: Churchill Livingstone. (1998). Copyright © 2018 Patil, Joglekar, Desai, Yadav, Sonawane, Chavan and Mohite. This is an open-access article distributed under the terms of the Creative Commons Attribution License (CC BY). The use, distribution or reproduction in other forums is permitted, provided the original author(s) and the copyright owner are credited and that the original publication in this journal is cited, in accordance with accepted academic practice. No use, distribution or reproduction is permitted which does not comply with these terms.